With the release of 2.5, the clipboard is no longer session-based, but persists between user sessions. You can now save your clipboard and it will be available when you open your browser the next time. The session is renewed when logging in or out of the application - so unless you save your clipboard, you might lose your results if you log in or log out! The following sections will introduce you to the Clipboard and the Clipboard menu in the AtoM header bar, as well as how the Clipboard can be used. The menu has four options. The “Clear selections” option will remove all items (across all entity types) currently pinned to the clipboard. On the clipboard page, they won’t be cleared until you refresh the browser, giving you an opportunity to repin them if you’ve removed them by accident - however, anywhere else in the application, this removal will be immediate. The “Go to clipboard” option in the menu will take you to the Cliboard page, described in more detail below. The “Save clipboard” option will allow you to save your selections and return to them at a future session, and the “Load clipbaord” option will load a previously saved selection. 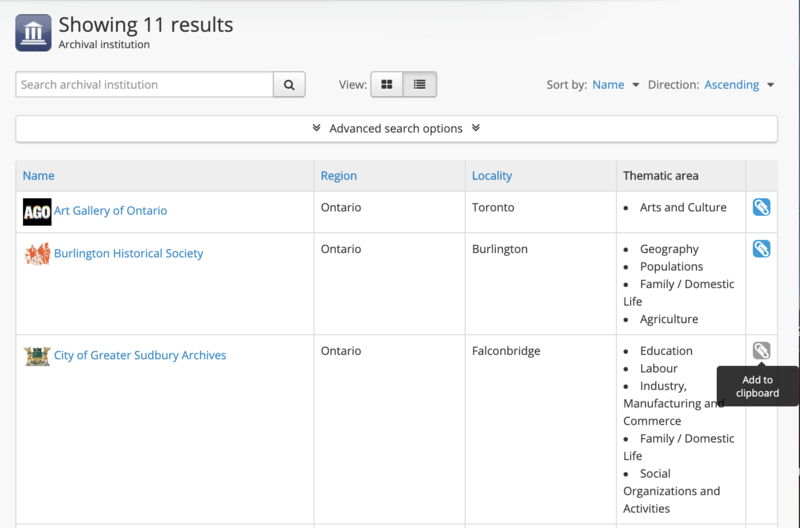 You can add as many results as you want to the clipboard at a time - the Clipboard will paginate if there are more than the global setting for results per page. When they are not selected, the clip icons are represented in light grey. When a user hovers over one, its background will turn grey, and a tooltip will appear. When a result has been selected and pinned to the clipboard by clicking on the clip icon, it will appear blue to indicate that the item is now pinned. 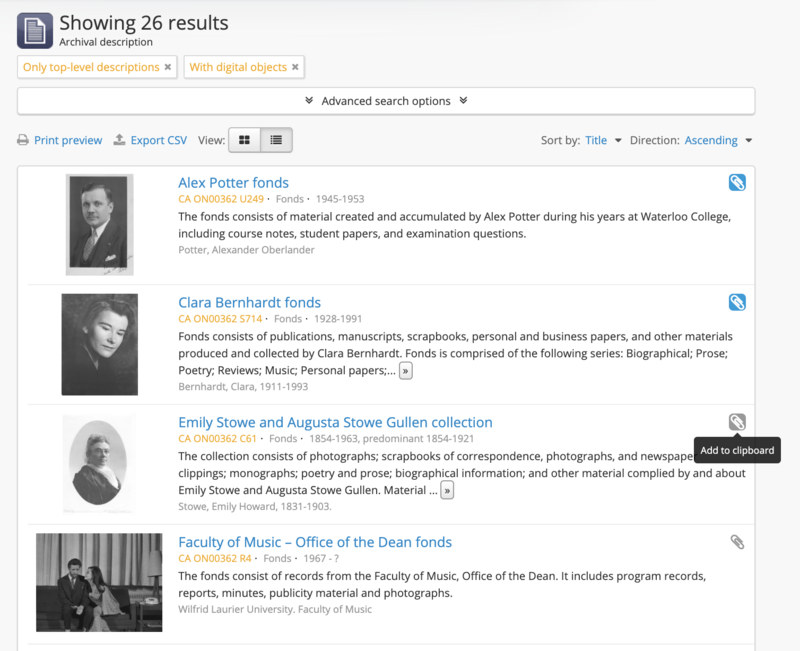 On the archival description results stubs that appear in search and browse pages, a “paper clip” icon (similar to the one used in the clipboard menu) appears in the upper-right corner of the results stub. Click on this icon to add the result to the Clipboard. 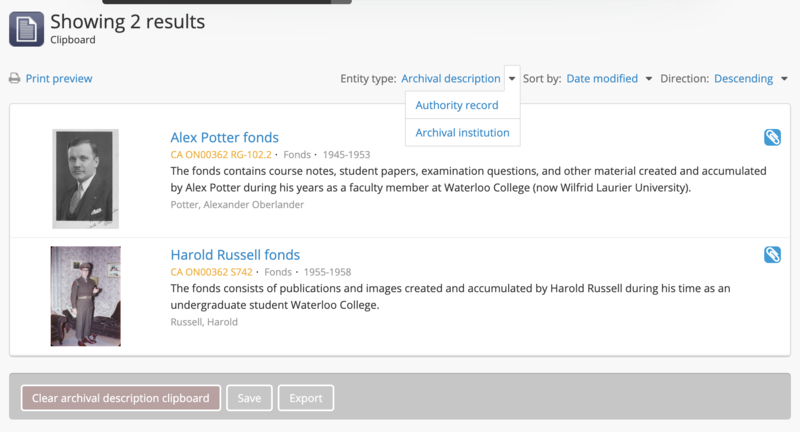 On the view page for an archival description, authority record, or archival institution record, the option to pin the current record to the clipboard is found in the right-hand context menu, under a “Clipboard” heading. When the item has not yet been pinned to the clipboard, the text link in the sidebar will read “Add”. Click the link to add the current description to the clipboard. Once selected, the link, now outlined in blue to indicate the item is pinned, will read “Remove” - click the link again to remove the item from the clipboard. 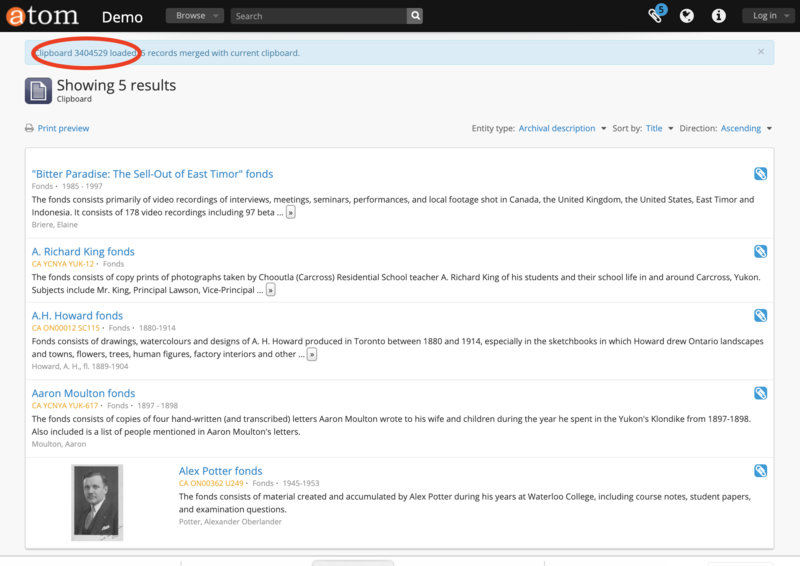 When you’ve selected the records that you want, you can navigate to the Clipboard using the “Go to clipboard” link in the Clipboard menu, found in the AtoM header bar at the top of the page. 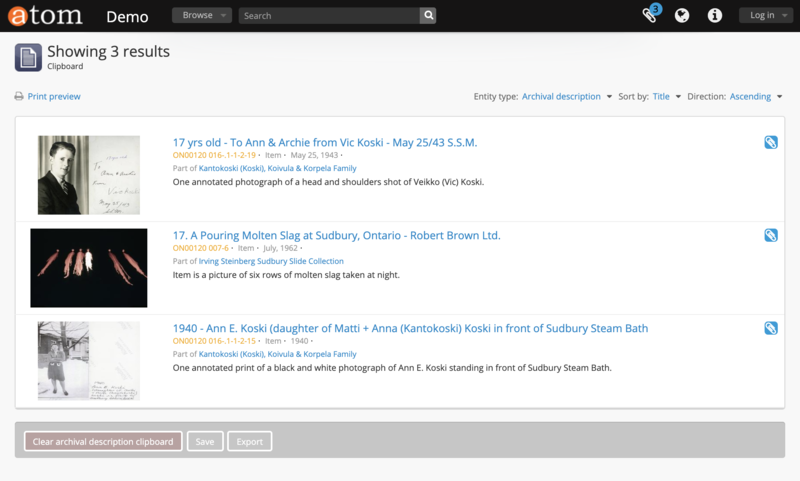 On load, you’ll see results stubs for the descriptions you’ve pinned. If there are more than 10 results, a pager will appear. 10 results per page is the default global setting in AtoM, but an administrator can change this value via Admin > Settings. For more information, see: Results per page. A count of the results attached to the clipboard for the current entity will appear at the top of the page (tip: remember you can always see the global count, and a breakdown of each entity, in the clipboard menu drop-down). Below this, and above the Clipboard results, are several action links - A print preview button on the far left, A Sort buttons on the far right, and the Entity type drop-down menu. At the bottom of the page, in the button block there is an option to clear results. This button behaves differently than the option in the clipboard menu - it will only clear results for the current entity (e.g. archival description, authority record, or repository record), leaving other entity records pinned to the clipboard. Authenticated (i.e. 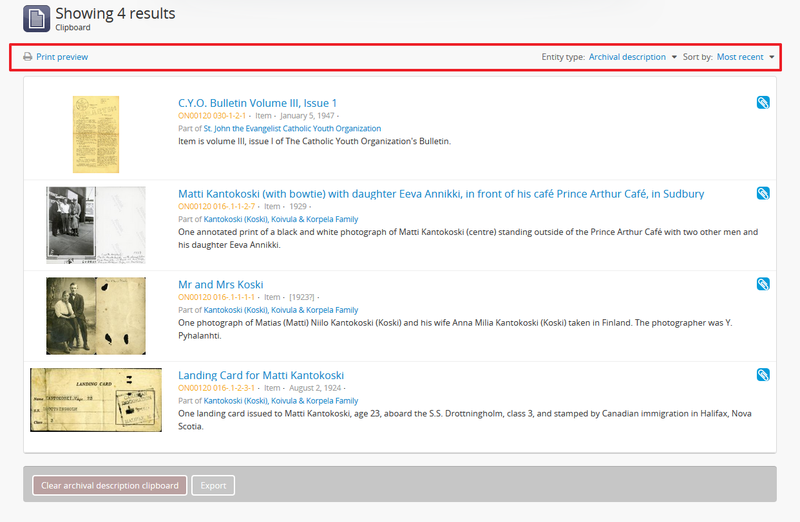 logged in) users will also see an Export button in the button block - for more information on exporting from the clipboard, see: Export Clipboard results in CSV format. Clicking this option will display a printer-optimized version of the page, with all buttons removed. Note that you will still need to use your browser’s built-in print options for actual printing. 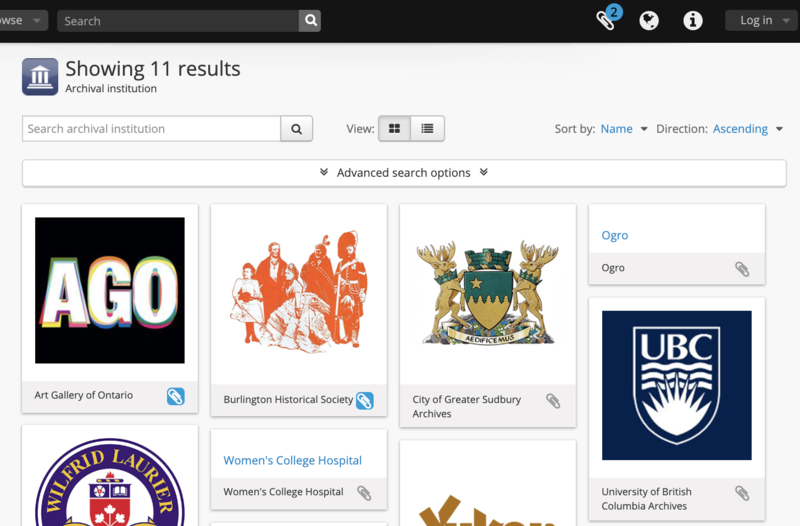 These buttons will allow you to sort your pinned results a number of different ways. 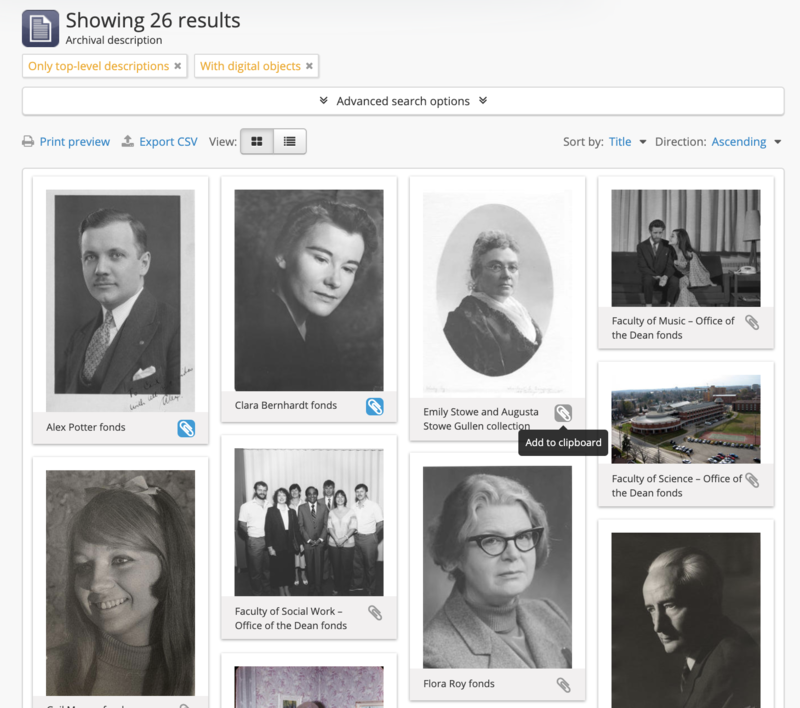 For more information, see: Sort buttons. Authenticated users (e.g. 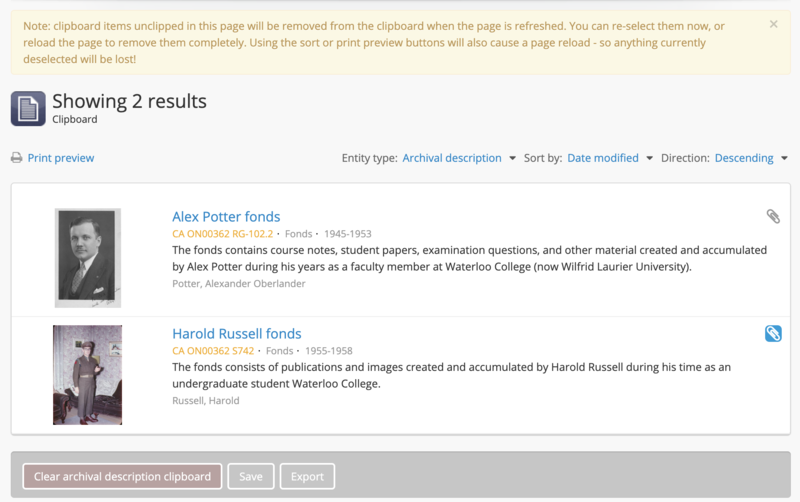 those logged in) can generate a CSV export of their clipboard results. When ready, the CSV is made available on the Jobs page. For more information, see: Export Clipboard results in CSV format. Note: clipboard items unclipped in this page will be removed from the clipboard when the page is refreshed. You can re-select them now, or reload the page to remove them completely. Using the sort or print preview buttons will also cause a page reload - so anything currently deselected will be lost! You can re-add results at this point, by clicking on the paperclip icon next to the result again if desired. 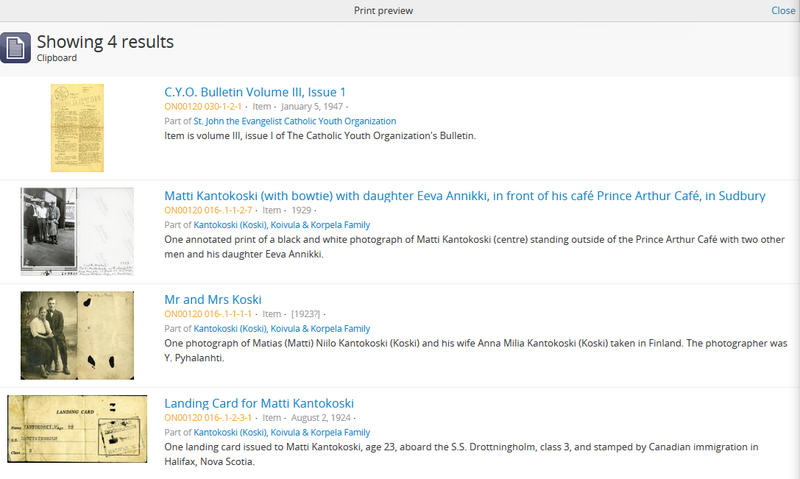 If you use any of the options on the page (Print preview, Export, or change the sort order with the sort button), the page will reload - so your unpinned results will be lost. If you manually refresh your browser, this will also cause results unpinned on the Clipboard page to be permanently removed. 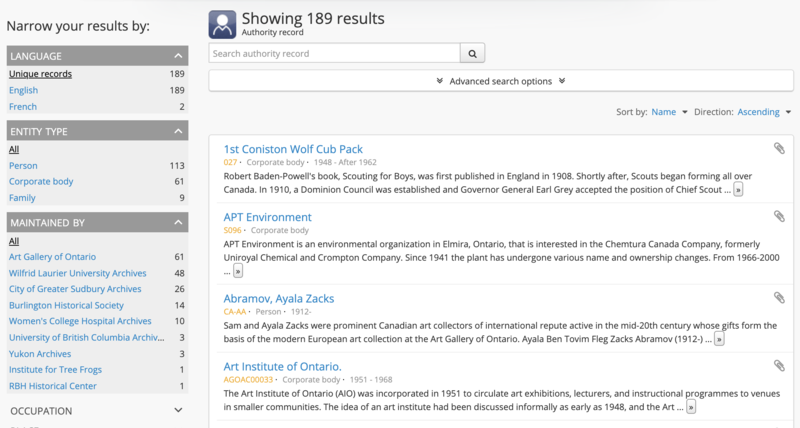 To re-add lost results after a reload, you will have to return to either the relevant record’s view page, or find it again via Search or Browse and re-add it to the clipboard. To remove all results at once, you can either use the “Clear selections” option found in the Clipboard menu in the AtoM header bar (see above, Clipboard menu), or you can use the “Clear” button found in the button block located at the bottom of the Clipboard page. Remember, the Clear option in the Clipboard menu will remove all results from all entity types at once, without warning. 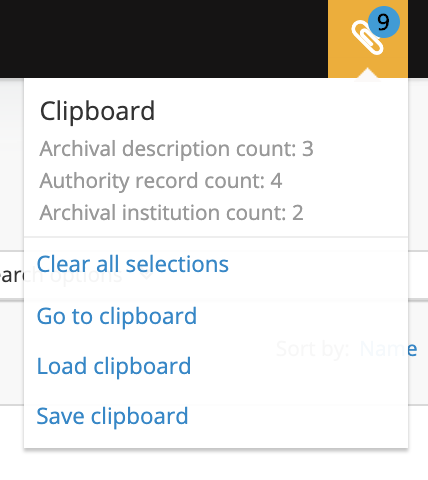 The Clear button on the bottom of the Clipboard page will only remove the current entity type - so if you clear archival descriptions, your authority records and institution records will still be pinned. You will still be provided with the warning when using these options on the Clipboard page - but be aware: using the “Clear selections” option in the Clipboard menu when elsewhere in the application will immediately remove all results! The clipboard has been configured so that all users, whether anonymous (i.e. public) or authenticated (i.e. logged in), can export records, in both CSV and XML formats, depending on the formats supported in AtoM for export. With the release of 2.5, you are able to save your clipboard, close your browser, and return at a later time to continue to use your saved entries. 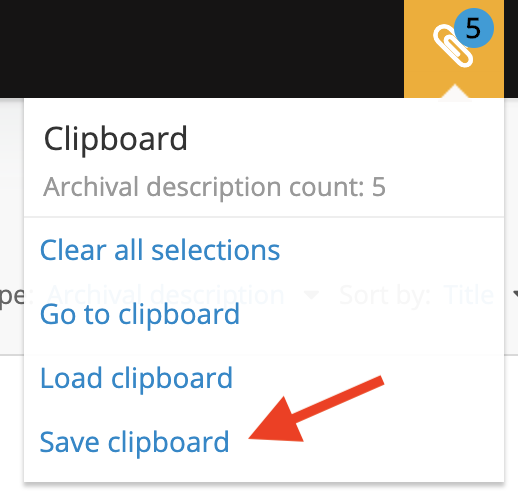 When you are ready to leave your current session, click on the clipboard menu button and choose “Save clipboard”. AtoM will generate a message with an ID number of your saved session and prompt you to record the number for later. You can then exit your browser. 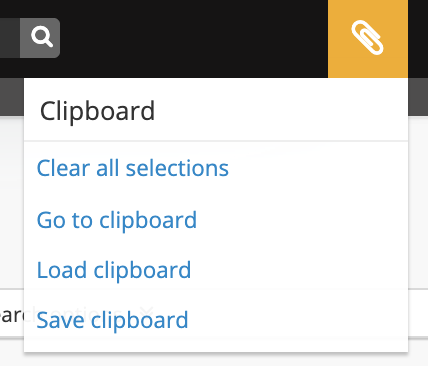 When you return and want to see your clipboard, choose “Load clipboard” from the menu and enter your saved number. Your previously saved results will load. Note that if you have saved entries from different entity types, they will all be saved. You can switch entity types from the menu at the top right.